Ford enthusiasts typically lament the models offered in Europe, Asia and Australia not coming our way. South America usually isn’t in that mix, but it could be if the Ford Ranger Storm is any indication of what we are missing. Sure, the Ranger Storm is a concept. Yet the F-150 Raptor and the EcoSport Storm inspired its design. The EcoSport Storm is the South American crossover with a normally aspirated, 2.0-liter inline four-cylinder engine and a 6-speed automatic transmission. Could the Ford Ranger Storm be a south-of-the-border (way south of the border) design exercise to see if the Ranger Raptor could work in North America? Probably not, because it has been “officially” announced the Ranger Raptor is not coming here. The Brazilian Ford Ranger Storm is a concept that comes with mudguards, ceiling rack with LED lighting, snorkel, sea cap, pickup bed with integrated rails, platform-type side braces, off-road bumpers and tow hooks. The black front grille with the “Storm” name in large print has two silver C-shaped friezes that are supposed to simulate claws. The headlights incorporate LED daytime running lights. The bumper incorporates double fog lights, with frames that replicate the hive-like truss of the center grille. Pirelli MTR Scorpion 285/70 R17 tires reinforce the off-road character of the truck. As the top-of-the-line Limited version, the Ford Ranger Storm is equipped with a 3.2-liter 200-hp diesel engine, six-speed automatic transmission, SYNC multimedia center, seven airbags, rear camera, parking sensors and autopilot with speed limiter. It also has several features that enhance steerability. In addition to electronic stability and traction control, it has the exclusive adaptive load and anti-take-up control, ramp start assist, automatic descent control, trailer swing control and emergency braking assistance. 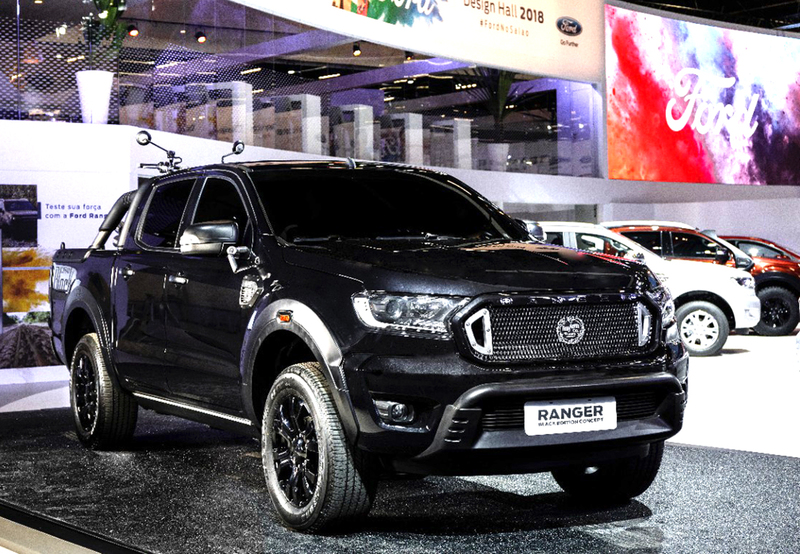 Also at the Sao Paulo Auto Show, Ford Brazil introduced the Ranger Black Edition Concept (above). It is inspired by a model introduced initially by Ford Asia and then copied globally. Its focus is mostly on all things black in the body, wheels, mirrors, and door handles, in addition to headlights with black trim. 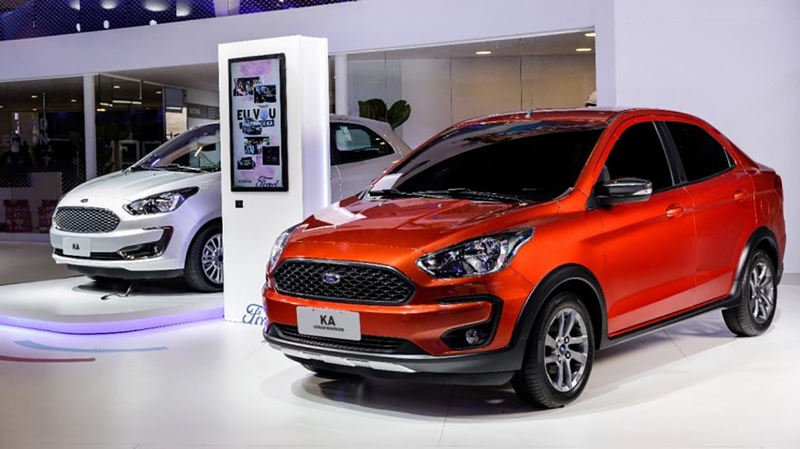 The Sao Paulo show also featured a Ford Ka concept called the Urban Warrior sedan. Frankly, it’s a bit of a snoozer as the picture shows. We should be glad it won’t be making its way north.